If you happened to be checking Twitter this morning, you may have noticed a bit of a furor centered on Dead Island Riptide publisher Deep Silver. Why? Well, it seems that the Internet masses don’t much appreciate free swag when it comes in the form of a bloody, limbless, decapitated young woman. Early this morning the firm revealed the upcoming “Live Bait Edition” release for Dead Island Riptide. You can see it pictured above. For the most part it’s a rather standard collection of low-cost extras designed to tempt anxious prospective players into dropping extra cash for a more exclusive version of Deep Silver’s imminent open-world zombie killing simulator. 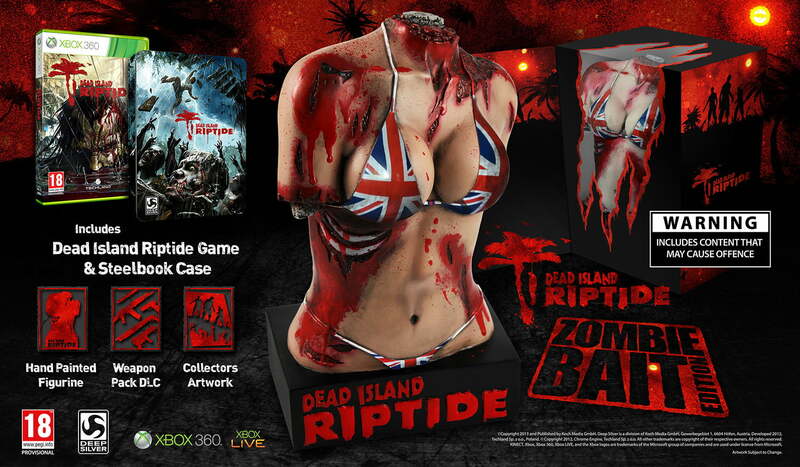 It includes such bonuses as a steelbook case for Dead Island Riptide, concept art assets, bonus downloadable weaponry, and a 12-inch-tall statue of a female torso sans head and arms, covered in blood, and clad only in a skimpy Union Jack bikini. Assuming you live in either Europe or Australia (the Live Bait Edition is exclusive to these territories) all of that could have been yours for only £100. However, after this morning’s outcry against the statue, Deep Silver offered up an official apology which leaves the Live Bait Edition’s future in question. Despite claims that “this will never happen again,” it’s important to remember that this is not the first time Deep Silver has found itself in hot water with would-be defenders of women. In September 2011, shortly before the release of the original Dead Island, fans discovered a line in the code of a leaked version of the title which referred to one of the in-game skills as “Feminist Whore.” Though this phrase was changed for the final version of the game, enough remained within the game’s code to create controversy, and both Deep Silver and developer Techland were forced to apologize and claim that such things would never happen again. Sound familiar? While we expect to hear more on how Deep Silver plans to alter the Live Bait Edition in the near future, gamers in North America can rest easy; this debacle only affects their analogues in PAL territories. This side of the Atlantic will see the Dead Island Riptide Rigor Mortis Edition on April 23. It will set you back $80, which, given that the Live Bait Edition was to cost the equivalent of $160, is a pretty solid deal, even if it doesn’t include this week’s most notorious gaming controversy.